gill1109 wrote: What's in a name? A variable is a variable. The word "variable" belongs to mathematics. When we call a variable hidden we are adding physical interpretations to a mathematical model. Not directly observable yet "behind the scenes" causing things to be how they are. Do you still think the experimenters in the real experiment need to know something or anything about the hidden variables? If so, why? The experimenters need to follow unambiguous instructions. They don't need to "know" about the different theories they are testing. Not once the experimental protocol is written down. So they don't need to know anything about the hidden variables at all. Correct? If you don't think that is correct, then please explain why they would need to know about the hidden variables. It seems pretty simple to me. 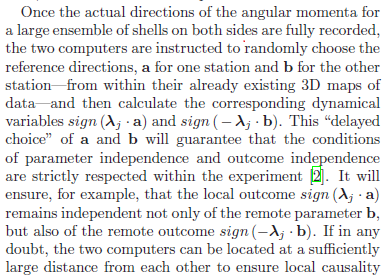 They record the angular momentum directions at particular angles for a and b, then take those results and calculate the correlations per Joy's eq. (16). That is all they have to do. There is nothing else. Their results will either show -a.b, or not or maybe they might discover something inbetween. They don't need to know anything about the simulations if they don't want to. But if you are trying to simulate what Nature might be doing to suit a certain theory, you will have to have those hidden variables in the simulation that the theory says are in Nature. Ok, that is the last time I am going to explain it. Either you get it or you don't. gill1109 wrote: The experimenters need to follow unambiguous instructions. They don't need to "know" about the different theories they are testing. Not once the experimental protocol is written down. gill1109 wrote: Everything in my world appears self-consistent to me. But everything in your world is hardly self-consistent. Among many other things, two of the four correlations you have been calculating do not even reside on the local-realistic correlation surface generated in this simulation in response to your challenge: http://rpubs.com/jjc/19298. I would hardly call that self-consistent. This contradiction should have made you realize that all the calculations you have been doing are wrong. There is a fundamental inconsistency in your statistical worldview, and my simulation gives you a brilliant opportunity to correct it (albeit at a price of 10,000 Euros). Now this I call self-consistent. I have cleaned up some of my other simulations by incorporating what we have learned during the past few weeks. Here is an example of a cleaned-up simulation of my 3-sphere model: http://rpubs.com/jjc/16567. The most important conceptual clarification in this simulation is that, what appeared as a "post-selection" of states to the flatlanders, has now been relegated to the "state preparation" of the pre-selected initial states of the system. This was never a problem from the perspective of the 3-sphere, but the flatlanders were having a great deal of difficulty understanding my model because of it. But now the N spin directions, "v", which are actually observed by Alice and Bob, are all pre-selected, thereby removing the last vestige of the Bell-baggage from the simulation. where the measurement directions a and b are randomly selected, respectively, by Alice and Bob. Note that not a single one of Bell's assumptions has been dropped. 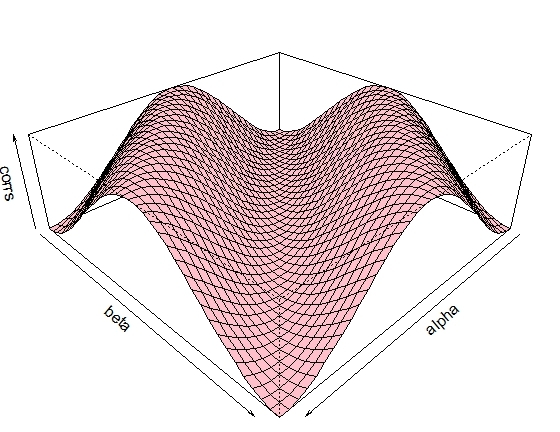 Below is a version of Joy's simulation showing that creating the direction files for Alice and Bob that they observe and then reading them back in works in the simulation for when the angles a and b are random. However, if I comment out the write.csv lines and try to read the files back in on a subsequent run, it doesn't work right. The graphic has some distortion in it. Is there some kind of problem with the files syncing with the loop? ## coordinates of points on a unit circle in the equatorial plane. FrediFizzx wrote: Below is a version of Joy's simulation showing that creating the direction files for Alice and Bob that they observe and then reading them back in works in the simulation for when the angles a and b are random. It is good to know that by feeding the spin directions back into the simulation the correlation surface is reproduced exactly. This proves that the spin directions we extracted from the simulation are correct, and Richard is simply doing his calculations incorrectly by fixing the measurement directions a and b "outside the loop." Incidentally, two of our three adjudicators, Hans de Raedt and Gregor Weihs have come out in support of me: the files of directions which Christian submitted did not win the 10 000 Euro challenge - I talk here of the challenge as formulated, not as how it might have been in another parallel universe. We are still waiting for Andrei Khrennikov, who is probably still recuperating after the excitement of last week, and moreover, I imagine, is a bit computer-challenged, compared to the other two. So no official pronouncement yet. FrediFizzx wrote: gill1109 said "What's in a name? A variable is a variable. The word "variable" belongs to mathematics. When we call a variable hidden we are adding physical interpretations to a mathematical model. Not directly observable yet "behind the scenes" causing things to be how they are." I can read what is written on page 4 of the experimental paper. I can't make anything different out of it from what I made out of it, and described in the challenge formulated elsewhere on this forum. Christian spent weeks trying to win the challenge as formulated. Now he claims he has won by doing something completely different to what is written in his experimental paper, and moreover something we all here only have known about since a few months ... since I decoded Pearle (1970) and expressed it as a computer simulation. Seems a bit fishy to me. But everyone can believe just what they like, sure. Now for sure, Christian can simulate his hidden variables in order to simulate the data which he believes his experiment would generate. But in that experiment, after the video films have been taken of the exploding balls, everything is in flatland. Some image processing software is used to calculate directions of angular momentum u and v of some macroscopic objects. Then a calculation is done following formulas in the paper. Flatland formulas. No more hidden variables. I am afraid I am unimpressed by Richard Gill’s comments above. In my opinion I have defeated his challenge decisively, by reproducing the entire correlation surface predicted by QM correctly. What is more, I have been able to accomplish this by providing N pre-selected spin directions, as demonstrated in this simulation. This suggests that my proposed experiment will be a spectacular success. It will reproduce the strong correlations exactly as I have predicted in my papers. Contrary to what Richard Gill says, my model has nothing whatsoever to do with the detection loophole or conspiracy theory. It simply points out the correct topology of the physical space, which has been ignored by the Bell community---rather surprisingly---for the past 50 years, as I explain here: http://arxiv.org/abs/1405.2355. The evidence I have presented so far has been neatly summarized in this simulation of my 3-sphere model: http://rpubs.com/jjc/16567. The most important conceptual point here is that, what appeared as a "post-selection" of states to the flatlanders like Richard Gill, has now been formulated as a "state preparation" of the pre-selected initial states of the system, originating at the source. This was never a problem from the perspective of the 3-sphere, but the flatlanders were having a great deal of difficulty understanding my model because of it. But now the N spin directions, "v", which are actually observed by Alice and Bob, are all pre-selected at the source (rather than post-selected at the detector), thereby removing the last vestige of the Bell-baggage from the simulation. On the other hand, Richard Gill's incorrect calculations of the four correlations contradict the evidence presented in this simulation. Note that two of his four correlations do not reside on the correlation surface presented in the simulation. Evidently, he has got his calculations badly mixed up, as I explained previously. Last edited by Joy Christian on Mon Jun 16, 2014 8:40 am, edited 1 time in total. And the fact that the pre-selection at the source uses a formula that depends heavily on detector settings a and b doesn't bother you at all? Heinera wrote: And the fact that the pre-selection at the source uses a formula that depends heavily on detector settings a and b doesn't bother you at all? Why should the fact that the pre-selection of N vectors "v" at the source does not depend at all, even lightly, on the future detector settings a and b bother me? Christian can't read R code. So he can believe whatever he likes. Gill lives in a flatland. So he can only see his flatland in my R code. I think we can now say publicly that Christian's bid to win my challenge before June 11 has failed. Gregor Weihs and Hans de Raedt have independently calculated the four correlations from both of Christian's recent submissions and in every case at least one of those correlations deviated more than 0.2 from target (+/- 0.7071). I suspect that Andrei Khrennikov is not going to respond to the request to adjudicate. The challenge remains open but the prize now goes down to 5 000. But of course, if Christian's experiment is ever done, and if it succeeds in reproducing the singlet correlations when the data is processed as in page 4 of the experimental paper and as described in the challenge, then Christian still can win two times 5 000 Euro: once for our original but cancelled bet (because I'm a gentleman), and once for the challenge (if no-one else has won it in the meantime). However if Christian desires to be vindicated by Nature through experiment, I recommend he revises his experimental paper, explaining to the experimenters how to calculate correlations in S^3 instead of in flatland. gill1109 wrote: However if Christian desires to be vindicated by Nature through experiment, I recommend he revises his experimental paper, explaining to the experimenters how to calculate correlations in S^3 instead of in flatland. It is quite amusing that you still don't "get it" about the hidden variables. Nature does the S^3 correlations; the experimenters don't have to calculate correlations in S^3. Joy tried to show that better in the latest simulation but you still don't "get it". Your loss. gill1109 wrote: I think we can now say publicly that Christian's bid to win my challenge before June 11 has failed. Gregor Weihs and Hans de Raedt have independently calculated the four correlations from both of Christian's recent submissions and in every case at least one of those correlations deviated more than 0.2 from target (+/- 0.7071). On the contrary, I have defeated Richard Gill's challenge decisively, by not only unambiguously constructing the N spin vectors he had claimed were impossible to construct (as a “proof of concept” for my proposed experiment), but also by constructing the entire correlation surface correctly: http://rpubs.com/jjc/19298. The evidence I have presented in the above simulation is here for everyone to see. On the other hand, it is also easy to see that the four correlations calculated by Richard Gill are simply wrong. Two of his results do not even lie on the correlation surface constructed in the above simulation. In other words, the four correlations he has calculated are not predicted by my model or my proposed experiment, or supported in any way by the data files of directions extracted from the simulation. As Fred has so clearly demonstrated above, one can easily feed the spin directions back into the simulation and see that they reproduce the correlation surface exactly. What is more, I have been able to generate the above correlation surface in a manifestly local-realistic manner, by providing the N pre-selected spin directions. This suggests that my proposed experiment will be a spectacular success. It will reproduce the strong correlations exactly as I have predicted in several of my papers. The evidence I have presented over the years for my 3-sphere model has been neatly summarized in this simulation: http://rpubs.com/jjc/16567. The most important conceptual innovation here is that, what appeared as a "post-selection" of states to the flatlanders like Richard Gill, has now been formulated as a "state preparation" of the pre-selected initial states of the system, originating at the source. This was never a problem from the perspective of the 3-sphere, but the flatlanders were having a great deal of difficulty understanding my model because of it. But now the N spin directions, "v", which are actually observed by Alice and Bob, are all pre-selected at the source (rather than post-selected at the detector), thereby removing the last vestige of the Bell-baggage from the simulation. In conclusion, the Gill challenge is no more. I have defeated it decisively, by explicitly constructing the spin vectors he had claimed were impossible to construct. Pity for you that the adjudicators disagree. gill1109 wrote: Pity for you that the adjudicators disagree. I have yet to hear from the Chairman of the adjudicators. Besides, the truth spelt out by me above does not need any adjudication. It is for all to see for themselves. There is no chairman of the adjudicators. They are self-organizing. The letter I sent to those three gentlemen did not prescribe their internal organization. But you can bother Andrei if you wish to grasp at straws. As far as I'm concerned, we're finished. However if the three adjudicators together wish to revise the preliminary judgements made by two of the three, I'm willing to hear their arguments. That's all. Do you copy? Over and out. Christian's, Diether's and Gill's conclusions were foregone conclusions. Gill correctly predicted de Raedt's and Weihs' conclusions. Everything is on record. Everyone else can judge for themselves. gill1109 wrote: As far as I'm concerned, we're finished. As far as I am concerned, we are indeed finished. The Gill challenge is no more. I have defeated it decisively, by explicitly constructing the spin vectors Richard Gill had foolishly claimed were impossible to construct. The facts I spelt out here do not need any adjudication by anyone. They are for all to see for themselves. Good. Maybe Fred (our friendly and just forum admin) would like to close down this topic now.